SF Taxi Media: Taxi Driver Vs. The DPT, Round 3, Ticket Dismissed! After Long Wait, Court Favors Driver. By John Han. Taxi Driver Vs. The DPT, Round 3, Ticket Dismissed! After Long Wait, Court Favors Driver. By John Han. 2) My original letter requesting the SFMTA for administrative review, and then for in person meeting with an MTA hearing officer. 3) The copies of the MTA’s subsequent responses denying my requests for dismissal. 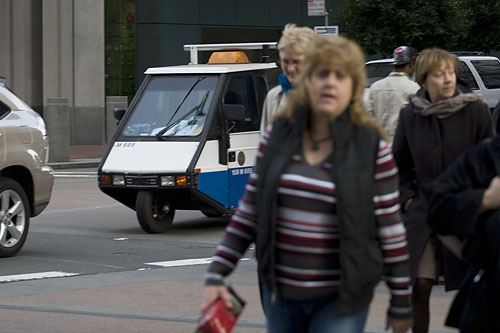 5) Copies of enforcement bulletins from 1994-2005 provided by SFMTA Taxi Services Division. 6) A copy of the most recent notice to taxi workers from SFMTA Taxi Services regarding unfair PCO’s. 7) Photographs along the Embarcadero where the ticket was issued. He tore off a piece paper and gave it to me, and said to hold on to it until I get my refund, and that was it. The court commissioner, the clerk, and even the police officer that I guess is like the court bailiff, were courteous and professional. They made me feel like I was actually in a "hall of JUSTICE". I left with the impression that the State’s courts can have a realistic view of what is fair and unfair, and that they were there to administer the law... nothing else. I'm sorry that I can't say the same thing for the way it previously went down with the MTA's hearing officer. That was a nightmare. That's just been my experience. I hope others have had better. Meanwhile, there was another “Blocking the Bike Lane” ticket I had gotten around the same time in late 2010 and was supposed to contest as well. I lost that one on a technicality that was my own fault and had to pay $105. That’s because I had gotten my dates mixed up on when the deadline was to have an in person meeting with the MTA's hearing officer. Thinking I had an extra week to make a hearing, I showed up at the SFMTA office a week after the actual deadline. There was no chance to reschedule. Won one, lost one. Leo Durocher once said, "A tie is like kissing your sister..."
Yeah Yeah! "A tie is like kissing your sister." The point is that if I had got the dates right on the bike lane ticket and made my request for dismissal on time, the appeal process would have continued to gone on, and the court would've most likely dismissed that ticket too. So in the end, the appeals process would've worked and I would've won. That would've been two for two in wins. I'm not proud of myself for getting the dates mixed, and therefore losing that ticket on a technicality. But that's the point. It was lost on a technicality, not by a court's decision. If it was up to the court, I feel I would've won the second ticket too.